The sophomore credits his positive attitude as one of the reasons he was able to take first place in the boys B Division at the SJISA 6-Dive Championships on Jan. 17 at GCIT. Haddonfield Memorial High School’s John Furner puts the finishing touches on one of his attempts at the SJISA 6-Dive Championships on Jan. 17 at Gloucester County Institute of Technology. Furner won the boys’ B Division with a score of 218.15. 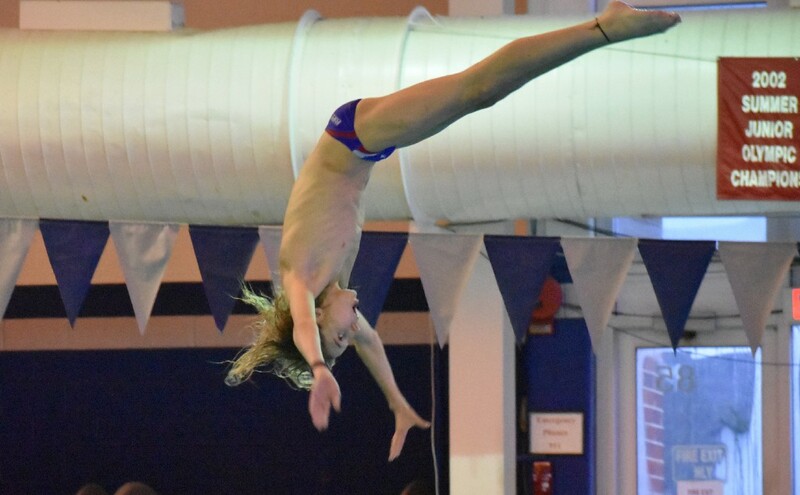 For his sophomore season, Haddonfield Memorial High School’s John Furner’s focus isn’t just about improving the technical aspects of his diving. A lot of his focus is simply on improving his attitude. Furner’s attitude was very positive in the first South Jersey Interscholastic Swimming Association diving meet of the season on Jan. 17 at Gloucester County Institute of Technology. Furner took first place in the boys B Division of the SJISA 6-Dive Championships with a score of 218.15. It was the first time Furner has taken first place in an SJISA high school meet. Furner improved slightly on his score from the 2018 season and believes he made progress in a number of areas since last season. One big difference for Furner is he gained some height in the past year. Furner’s solid performance in the meet comes off an outstanding freshman season where he placed in the top-10 in the state. Qualifying for the NJSIAA Diving Championships in 2018, Furner finished in seventh place with a score of 379.05. Only two other South Jersey divers, Dillon Hall of Cherry Hill High School West and Colin Hickey of Kingsway Regional High School, finished ahead of him at states. Furner and Hickey were the only two competitors to score more than 210 points at the 6-Dive Championships, with Hickey winning the boys A Division with a score of 255.5. Even though the two compete in different divisions in the SJISA meets due to school size, Furner and Hickey have a history together, having competed on the same club team in the past, Blue Dolphin Diving. Looking ahead to the rest of the season, Furner wants to improve in a number of areas leading up to a return to the state championships in late February. Most of his focus is on simply being more consistent with his dives over the course of the season. “It’s mostly staying consistent with getting my scores, trying to do a little bit harder dives here or there, and overall just trying to be a better competitor as a person,” he said.